Derrick Peters was born on the 29th of November 1970 in Fort Hood, Texas where his father was stationed in the United States Army. His most memorable years were attending Muscle Shoals High School in Alabama, where he excelled as an outstanding student athlete. After graduating from high school, he continued his education at The College of William and Mary, where he received a full athletic scholarship in basketball. He graduated in 1993 with a Bachelor of Arts degree in Psychology and is a member of the Kappa Alpha Psi Fraternity Inc.
Derrick is married to Laquetta Peters and is the proud father of 5 children (Jordyn 17, Jacob 14, Kennedy 14, Kadyn 8 and Connor 4). His previous occupations include Juvenile probation officer, High School basketball coach, the Xerox Corporation and GlaxoSmithKline vaccines division. He is currently employed with the Women’s Health division of GE Healthcare as a product sales specialist. In his free time Derrick enjoys spending time with family, golfing and occasional travel. Derrick is inspired by seeing others succeed in the presence of adversity. Also, growing up as a military brat, he understands the many challenges that children go through as a result of their parent’s responsibilities. This is one of the many reason that working for non-profit organizations is so important to him. 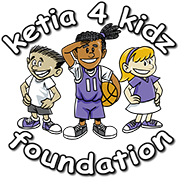 The Ketia4Kidz foundation will provide the perfect platform for him to give to those in need and to support the children of our country’s bravest and most dedicated individuals. Previous board appointments include: Muscle Shoals Parks and recreations dept., The Boys and Girls Club and The Upward Bound Summer Basketball League.